The most important advice about this recipe is not to read the instructions BEFORE beginning nor to chop most/all of the ingredients BEFORE turning on any heat — though both of those things are vital. For me, though, the most important note is this: Start your rice. Now. Have you started your rice yet? Don't forget, or you'll have gone through the somewhat lengthy process and created an amazing, fragrant, rich dish of authentic Thai food and have nothing on which to eat it. 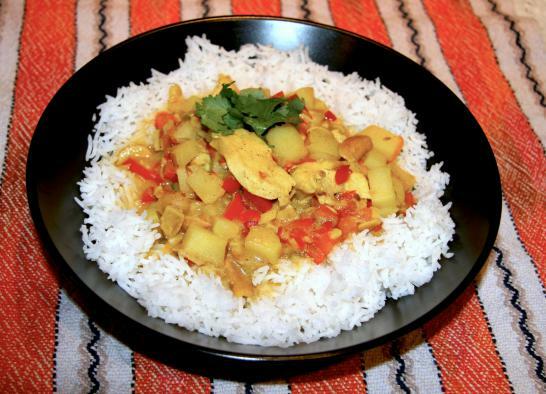 The curry, with or without rice, is also great served on naan bread. Seriously, the Internet is even providing food now, people! Tropical Traditions is America's source for coconut oil, and companies like it make my kitchen more international than ever. Heat a wok (or large frying pan) over medium-high heat, and swirl in coconut oil. Add the onion, ginger, garlic and jalapeno, and stir fry for 2 minutes until fragrant. Add the broth, as well as the bay leaves, turmeric, cashews, coriander, cumin seeds, white pepper, cardamon, lime juice, fish sauce and brown sugar. Stir well between each addition, and bring to a gentle boil. Add the chicken, stirring to coat, then add the coconut cream/coconut milk and potatoes. Return the mixture to a boil. Reduce heat to low or to whatever heat gives you a gentle but steady simmer. Simmer 30 minutes, stirring occasionally, then add red pepper and tomato during and simmer for an additional 10-15 minutes or until potatoes are tender. Taste the curry. Too sweet? Add a dash of fish sauce and/or lime juice. Too sour? Add a pinch of sugar. Too spicy? Add some coconut cream/milk. Massaman curry is Thai, not Indian.